Hyundai never left any stone unturned while designing luxury cars. Another example to their proficiency came into highlight at the Frankfurt Motor Show 2015. Here company shared details of their Hyundai Vision G Coupe Concept 2015.The concept is adorned with extremely gorgeous looks and power that makes it irresistible to have second glance. 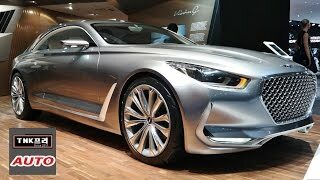 Let us have a lot at the review of Hyundai Vision G Coupe Concept 2015 to learn more about it. The interior of Hyundai Vision G Coupe Concept 2015 looks highly luxurious all drenched in quilted leather and wood. You can also notice gold accents which might look a bit divisive but I presume that the production model might not have these with it. Though the specifications and the exact features of the interior are not yet shared but the photographs share speakers housed inside. We believe the model might come adorned with great sound system for clear audibility. Major work is with the white and brown (wood). The seats, gear lever and the door panels come in white while the same parts have the essence of wooden texture (and over some place wooden work) over them. In all rounding up the entire interior details of Hyundai Vision G Coupe Concept 2015 I would say, though not clearly stated but the photographs narrate the saga of a super luxury vehicle coming very soon. 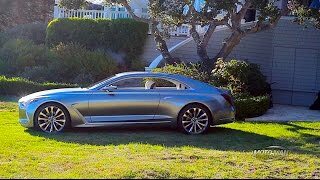 The exterior of Hyundai Vision G Coupe Concept 2015 very much looks like that of any grand tourer and at certain points you might notice resemblance with the 2016 Bentley Continental GT Speed. This clearly states that model has an impeccable touch of luxury, The massive chrome mesh grille upfront and the chrome accents makes it look adorable. On top of the grille is the long hood which is clearly drawn from the sands of time. There is another interesting feature in the concept and that comes with the automatically opening driver’s door, once the owner gets close to it. Though this for now sounds a bit like fable but believe me I won’t mind having this feature, after all this saves the need of a valet. 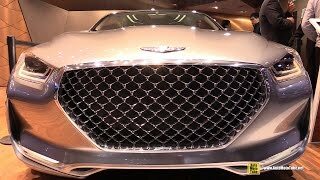 Thus rounding up the exterior details of Hyundai Vision G Coupe Concept 2015 I would say it has everything out there that you might seek in today’s luxury vehicles. 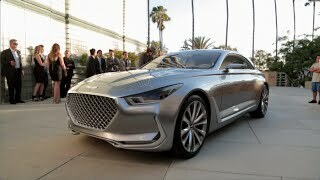 Powering the Hyundai Vision G Coupe Concept 2015 is the award winning 5.0 liter Tau V8 engine delivering total output of 420 hp and peak torque of 520 nm. The performance figures of Hyundai Vision G Coupe Concept 2015 are not yet shared but the engine so mounted makes us relish the presumptions to have a powerful number chart.